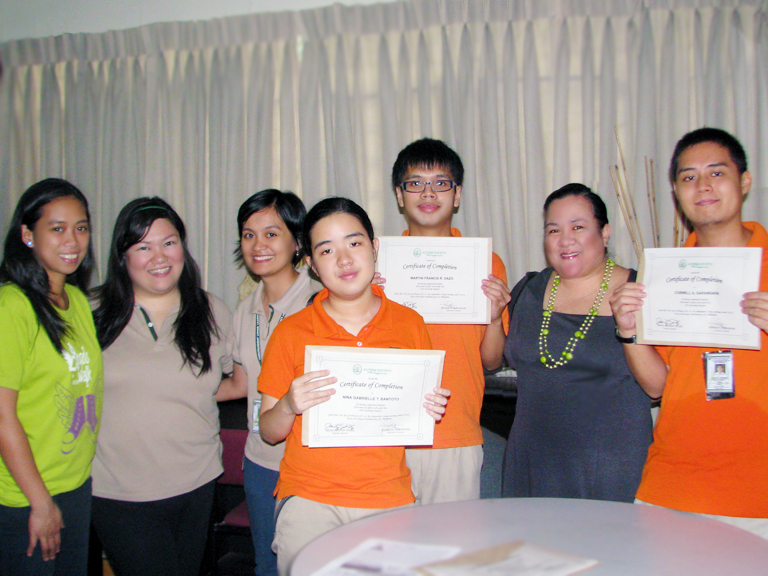 The Autism Society Philippines awarded certificates of completion last 13 February 2013 to students from the Independent Living and Learning Center who completed forty hours of internship at the ASP Office. Mona Magno-Veluz, ASP National Secretary and Project Sponsor, opened the round table meeting with the ILLC educators led by Teacher Nina Carmela Almeda, the interns, Cornell, Nina and Michael, and their family members, with a message of appreciation for the students' contribution this school year. Not only did the students learn during their stay at ASP; but they also accomplished exceptional work comparable to neuro-typical employees. The interns were made responsible for the digitization of photographs and records which covered the more than two decades of ASPs existence. Ms. Veluz is confident that this effort it the beginning of an exploration into more work disciplines which are suited for young adults on the autism spectrum. The success of the program can be attributed to the proactive efforts of the team composed of the ASP Secretariat (Ranilo Sorongon as Executive Director and Ien Elises as Intern Coordinator), ILLC (Iris Garballo as Job Readiness Coach), supportive parents & guardians; and the eager and able interns. If you represent an institution interested in partnering with ASP for internship, please send a letter of introduction/intent to Executive Director Ranilo Sorongon at autismphils@gmail.com.